Customer Acknowledgement: I/We acknowledge that I/We received a copy of this notice, below. I agree to the terms and conditions of this application and give permission to Austin Subaru to run an automotive credit check on my behalf. Although this page may not have the security icon in your browser’s address bar, the form above is a secure form. The way this form is embedded in to this page, (iframe), does not allow for the browser to show the security icon. If you prefer to submit this form from a page which has the security icon in your browser, please click HERE to be redirected off of our website and directly to the secured form. Your information is safe and we will receive your application either way you choose to complete this form! 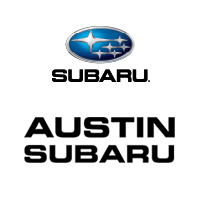 Thank you for your consideration for financing with Austin Subaru. Copyright Information and Personal & Non-Commercial Use Limitation. Notice and Procedure for Making Claims under the Digital Millennium Copyright Act. Trademarks.All other trademarks, product names, and company names and logos appearing on the Sites are the property of their respective owners. All comments, feedback, suggestions, ideas, and other submissions (“Ideas”) disclosed, submitted, or offered to Us in connection with Your use of this Site shall become Our exclusive property. You agree that unless otherwise prohibited by law We may use, sell, exploit and disclose the Ideas in any manner, without restriction and without compensation to You. You expressly agree that use of Our Sites, services, and Materials is at Your sole risk. Neither We nor any of Our officers, directors, employees, agents, merchants, sponsors, licensors, component suppliers (both hardware and software), and/or any third party who provides products or services purchased from, used, transmitted or distributed by Us (collectively “Providers”), or the like, warrant that sites affiliated with Providers, including, but not limited to, Our Sites, will be uninterrupted, error-free, or free of viruses, worms, Trojan horses, keyboard loggers, spyware, adware, malware, harmful or malicious code, or other defects. The information, products and services published on Our Sites may contain inaccuracies or typographical errors. Furthermore, information You may provide to Us online may be lost or destroyed due to technical problems with Our systems that are beyond Our control. We make no warranty as to the results that may be obtained from the use of Our Sites or as to the accuracy, reliability, or currency of any information content, service, or merchandise provided through Our Sites. OUR SITES ARE PROVIDED BY US ON AN “AS IS” AND “AS AVAILABLE” BASIS. TO THE FULLEST EXTENT PERMISSIBLE BY APPLICABLE LAW, WE DISCLAIM ALL IMPLIED WARRANTIES, INCLUDING BUT NOT LIMITED TO, IMPLIED AND STATUTORY WARRANTIES OF MERCHANTABILITY, FITNESS FOR A PARTICULAR PURPOSE, AND NON-INFRINGEMENT OF PROPRIETARY RIGHTS.WE MAKE NO REPRESENTATIONS OR WARRANTIES OF ANY KIND, EXPRESS OR IMPLIED, AS TO THE OPERATION OF OUR SITES, SECURITY OF OUR SITES, THE AVAILABILITY OF ANY GOODS OR SERVICES OFFERED ON OR THROUGH OUR SITES, INCLUDING E-MAIL, OR THE INFORMATION, CONTENT, MATERIALS OR PRODUCTS, INCLUDED ON OUR SITES. ANY MATERIALS DOWNLOADED OR OTHERWISE OBTAINED THROUGH THE USE OF OUR SITES IS DONE AT YOUR OWN DISCRETION AND RISK AND THAT YOU WILL BE SOLELY RESPONSIBLE FOR ANY DAMAGE TO YOUR COMPUTER SYSTEM OR LOSS OF DATA THAT RESULTS FROM THE DOWNLOAD AND/INSTALLATION OF ANY SUCH MATERIAL. SOME STATES OR OTHER JURISDICTIONS DO NOT ALLOW THE EXCLUSION OF IMPLIED WARRANTIES, SO THE ABOVE EXCLUSIONS MAY NOT APPLY TO YOU. WE DO NOT GUARANTEE THE CONTINUOUS, UNINTERRUPTED OR SECURE ACCESS TO OUR SITES OR ANY RELATED SERVICES. THE OPERATION OF OUR SITES MAY BE INTERFERED WITH BY NUMEROUS FACTORS OUTSIDE OUR CONTROL. YOU EXPRESSLY UNDERSTAND AND AGREE THAT WE WILL NOT BE LIABLE FOR ANY DAMAGES OF ANY KIND ARISING FROM THE USE OF OR INABILITY TO USE OUR SITES OR ANY RELATED SERVICES, INCLUDING, BUT NOT LIMITED TO, DIRECT, INDIRECT, INCIDENTAL, CONSEQUENTIAL, SPECIAL, EXEMPLARY, AND PUNITIVE DAMAGES WHETHER SUCH CLAIM IS BASED ON WARRANTY, CONTRACT, TORT (INCLUDING NEGLIGENCE), OR OTHERWISE, (EVEN IF WE HAVE BEEN ADVISED OF THE POSSIBILITY OF SUCH DAMAGES).THE LIMITATION OF THIS PARAGRAPH SHALL APPLY NOTWITHSTANDING ANY RELIANCE BY A YOU ON ANY INFORMATION OBTAINED FROM OUR SITES OR THAT RESULT FROM OUR OR OUR PROVIDERS’ MISTAKES, OMISSIONS, INTERRUPTIONS, DELETION OF FILES OR E-MAIL, ERRORS, DEFECTS, VIRUSES OR OTHER MALICIOUS CODE, DELAYS IN OPERATION OR TRANSMISSION, OR ANY FAILURE OF PERFORMANCE, WHETHER OR NOT RESULTING FROM ACTS OF GOD, COMMUNICATIONS FAILURE, THEFT, DESTRUCTION, OR UNAUTHORIZED ACCESS TO OUR RECORDS, PROGRAMS, OR SERVICES, AND WHETHER OR NOT WE HAVE BEEN ADVISED OF THE POSSIBILITY OF SUCH DAMAGES. YOU HEREBY ACKNOWLEDGE THAT THIS PARAGRAPH SHALL APPLY TO ALL CONTENT, MERCHANDISE, AND SERVICES AVAILABLE THROUGH OUR SITES.SUCH LIMITATION OF LIABILITY SHALL APPLY WHETHER THE DAMAGES ARISE FROM USE OR MISUSE OF AND RELIANCE ON OUR GOODS OR SERVICES, FROM INABILITY TO USE OUR GOODS OR SERVICES, OR FROM THE INTERRUPTION, SUSPENSION, OR TERMINATION OF OUR SERVICES (INCLUDING SUCH DAMAGES INCURRED BY THIRD PARTIES). SOME STATES OR OTHER JURISDICTIONS DO NOT ALLOW THE EXCLUSION OR LIMITATION OF LIABILITY FOR INCIDENTAL OR CONSEQUENTIAL DAMAGES, SO THE ABOVE LIMITATIONS AND EXCLUSIONS MAY NOT APPLY TO YOU.